Message: What was the jerk bait your were using to catch tarpon feeding on glass minnows in the Marquesas on the Mothership episode? 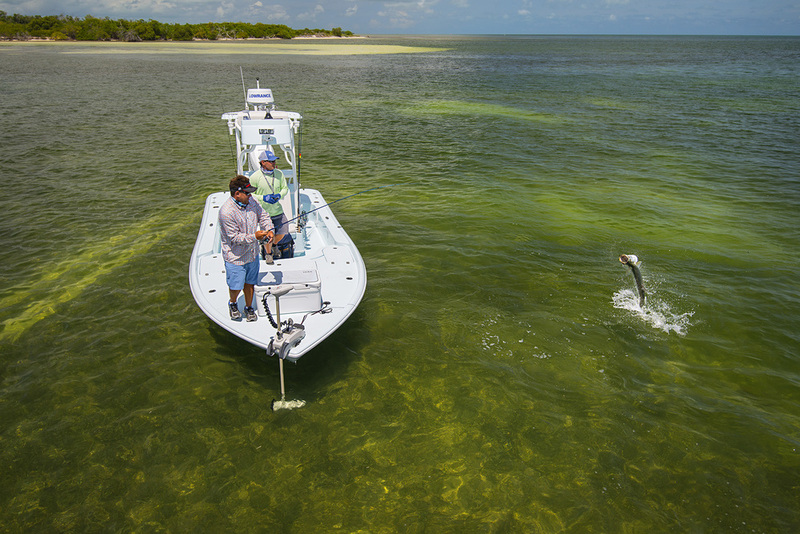 With the advent of braided fishing line, we can now throw very light baits a very long way and because of that, we started using the rig that you saw us catching tarpon in the Marquesas. The rig is super simple. I spool a size 40 or 50 Quantum Cabo with 20 lb Vicious braid and pair it with a 7 foot Med/Heavy action rod. I use a J Knot (click here for instructions) to tie a 40 lb Fluorocarbon leader onto the end of the braid and only use about 18 inches of leader. I want my knot to be snug to the end of the line rather than a loop in this situation so I finish the rig with a Clinch Knot to a size 4/0 Offshore Angler Circle hook. I will use 3 or 4 different baits depending on the size of the baitfish the tarpon are eating, how far I need to throw and whether or not the fish are super aggressive or kind of spooky. #1 Hogy Lures- I love the 10 inch original Hogy Lure. 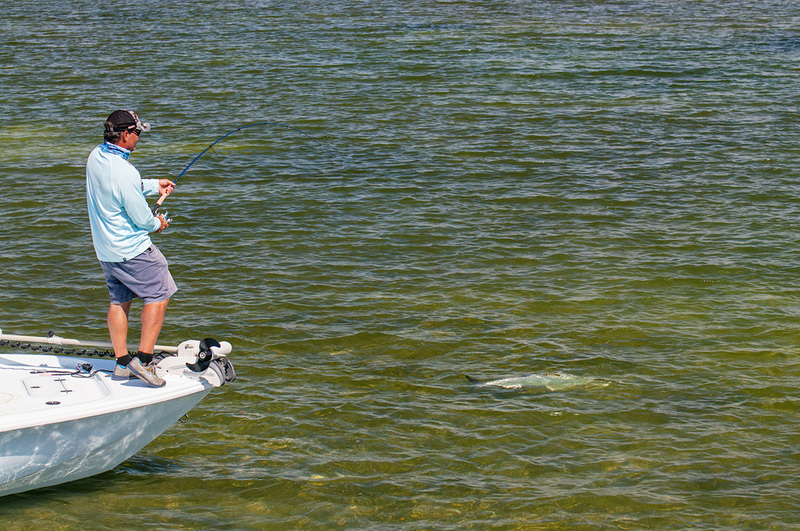 They now have so many styles that are all effective, but the most exciting bite on the flats is a tarpon crushing a 10 inch jerk bait. I simply rig this bait with a slightly larger circle hook (6/0) directly through the head. #2 ZMan Scented Jerk Shadz. This comes in a 5 and 7 inch model. I usually keep both in my boat, but find myself using the 5 inch rigged with a 4/0 Circle Hook rigged directly through the head of the bait. I will sometimes use the 7 but if I want a larger bait, I am more likely to jump to the 10 inch Hogy. The Elaztech material is stretchy and durable. I prefer this over standard plastic because I can catch a number of fish or get a number of bites without the bait coming off. This is crucial because a fish may bite several times before the hook finds a home. If they strip the bait off the hook on the first swipe...it's game over. If it stays on the hook, they will come back over and over until they get hooked. 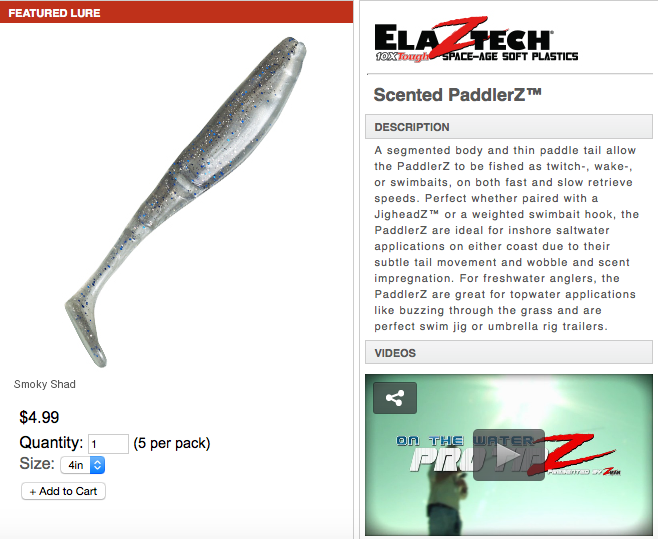 The Elaztech material also floats which makes for awesome surface strikes and allows me to cast well in front of a feeding fish and leave it sitting motionless while waiting on the fish to swim closer to the bait without fear of getting hooked on the bottom. Along these same lines, I could probably use just about any brand of jerk bait but I much prefer the more durable stretchy material. #3 Paddle Tail Baits. These are typically 3-5 inches long and have a paddle tail rather than a fluke style tail. They are a much lighter bait and, while very effective, prevent very long casts with just the circle hook rig. I really dont like fishing the way you saw us fishing on the Mothership show with a paddletail on a jig because it sinks to the bottom. The reason that this style of fishing is so effective is because we can throw a jerk bait way out in front of feeding fish without spooking them and then either pull it into their path or simply wait for them to move to the bait. It doesn't get caught on any weeds or the bottom. So I will only use this type of bait when I have run out of all the others or I am looking for a smaller profile due to the baitfish that the tarpon are feeding on. The glass minnows that the tarpon were concentrating on the day we were in the Marquesas were very small and that is the reason I chose this style of bait. I will rig each of these baits just like the picture below. It is extremely simple and allows the bait to swing on the hook and swim with incredible action. Give this rig a try with and let me know how it goes. Send me a picture or tag us on Social. Newer PostCan I Use My Starting Battery As My Trolling Motor Battery Too?